mob mentality from umno – as always, never change – welcome! ok begin from the beginning first (but of course! lol). 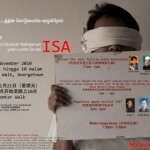 i attended the ’50 years under the brutal ISA’ event at komtar walk, penang, yesterday and whadyya know…. pro ISA protesters turned up to disrupt the event! i was there the whole day for all the events. reached there at about 10.30 when jin cheng from suaram was briefing the volunteers. 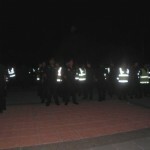 he did informed them that some trouble-makers might turned up, and true enough, they did – umno youth!! 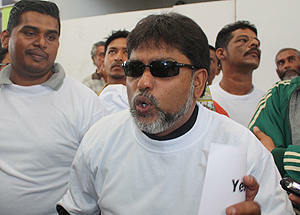 and lead by that ‘wanna fist fight with the CM‘ mamak hero, mohd ghani (the komtar merchants association vice chief). the event started at 10.30am with photo exhibition of the historical aspects of ISA. at 11.00am, the forum on ‘ISA, a political tool for oppression’ started. the speakers were all former ISA detainees. lim choo leong, socialist front activist, mohd sab, PAS activist, v. ganabatirau (one of the hindraf 5 detained) DAP activist and hishamuddin rais. while mohd sabu was talking, suddenly these group of ISA protestors turned up – lead by penang umno youth chief and that ‘komtar merchants hero’. about 50 of them, shouting loud and noisily. i notice almost all of them were mamak! (indian muslim). well their ‘hero’ abdul ghani mohammad jiman is a mamak himself too. notice this picture, abdull ghani was leading the group… and did you notice 2 children behind him? what? they used children for their protest?? horrors! then why nobody fire them for that. i remember few years back, many people (the govt esp) made noise that the anti isa and also the hindraf made use of children during protest/rally… and look now, umno did that but everybody close an eye! it is all right if they just stand there, away from the stage and shout but they had to surge forward to the stage to disrupt the speakers. oh of course they had to because that was how hooligans act. then i was thinking too if these pro ISA group want to protest or hold rally/forum, why can’t they organise one themselves to voice out their opinion, their support for ISA. why do they have to disrupt the anti ISA group? this was not the first time they did that of course. 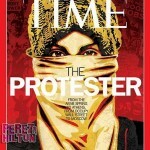 remember during the aug. 1 anti isa protest at speakers square, they did that too. this goes to show many things: they are not really pro ISA, they just want to disturb and disrupt the anti ISA group, they are paid by umno to purposely disrupt anti ISA group, they have no brains to organise a proper pro isa forum/rally or if they do organise one, very few people will turned up. so apa macam ini? so all they know how to do is to act like hooligans to disrupt people’s event. shame, shame, shame! and the way the mamak hero, abdul ghani acted, really like a gangster, what with dark sunglasses, big smile on his face and swinging his hands here and there. geli lah seeing him. eek! coming back to the event that day, after the pro ISA group surged forward, there were some tussle between the two groups. read about it in malaysiakini by susan loone (which i had CnP below). 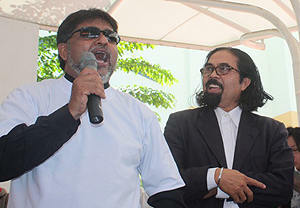 luckily hishamuddin was around as he was good at diffusing the tension and handled them well. he approached the mamak hero, abdul ghani, and allowed him to speak. hisham said that since they have a right to be heard, so let him speak. the first thing he said was that ISA is for ‘negeri, bangsa dan agama’. (country, race and religion). that alone sounded so silly. bangsa? what bangsa? malay? mamak like him and his goons that day? agama? which agama? the agama he masuk – islam? ok lah you go and read further what he said in malaysiakini as i don’t want to talk about him further. very fed up to talk about him!! not satisfied with making noises over the komtar merchants issue, now he wants to be mamak hero to champion ISA!! for umno!! well after this forum, there was a break for lunch. i went with shiela (from SABM penang) for lunch and we came back after 2.00pm for the books launch by dato toh kin woon. yb ng wei aik (CM’s political secretary) was there too to give a speech. the books are ‘beyond the blue gate’ by teo soh lung on her experience of detention during operation spectrum and ‘445 days under ISA’ by dr kua kia song on his experience of detention during operation lallang. to symbolise the launching, all the representatives of the different NGO were called up on stage to blow balloons and burst the balloons, several on-lookers too blew and burst the balloons together with them. after this, there was another forum, on ‘how do religion view ISA’ and there were 6 reps from the different religion – yb saari sungib, former ISA detainee and founder member of JIM, chong hung wah, adviser of young buddhist association of malaysia, dr bala tharmalaingam, national deputy president of malaysia hindu sangam and chrisanne chin, representing council churhes of malayisa youth. they gave good views which i have jotted down in my notebook. after the forum ended, i approached 3 of them personally to interview them as i need to write something for UCAN. wait when (or if) the article came out, i’ll update here or inform in new post. (UPDATED: read the article here). then there was a few hours break before 7.30pm when the entertainment began. shiela said she was tired so she went back. well i went shopping at watson and then went to the church office to rest. after having my dinner at new lane, i walked back to komtar walk for the show. it only started after 8.00pm! the show began with 2 rap songs by one of WCC member (or maybe he was a WCC volunteer), followed by a chinese song by an old man. quite long he sang… and he forgot he lyrics so many times. i would have thought having forgotten the lyrics, he would stop singing but he went on and on. since i don’t understand mandarin (was it mandarin or cantonese he sang in) i find it quite boring actually. i understand (from the MC) the song had something to do with fighting for freedom. after him, choon kai (formerly in suaram) gave a poem recital, followed by songs by 2 young men. then the highlight of the day – stand up comedy by hishamuddin rais. oh i thought he would be very good but i found his presentation not so funny. the last item was this band – forgot their name – which i heard them perform before many times e.g. 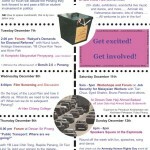 at speakers square and the ‘sape tour’ event. i like them as the songs they sang have good meaning touching on democracy, human rights, freedom. well by the time they finished it was 9.40pm… just in time for me to rush to the komtar’s bus station nearby to catch the last bus. oh don’t forget to read the report from malaysiakini and also go to my facebook photo album for photos i took during the event (over 40 photos). oh and the videos from me CJ pal, jimmy leow – part 1 and part 2. NOTE: the album will be up tomorrow. try to upload the photos while i write this post but it was only 10% uploaded and have to wait 20 mins for it to finish uploading. since it is my bed-time, i can’t wait! About 50 people from the Komtar trading area and Penang Umno Youth gathered at Komtar Walk to stage a rally to counter a civil society forum discussing the Internal Security Act (ISA) today. The forum entitled ‘Alat Politik untuk Penindasan‘ (A political tool of oppression), that is still in progress at press time, also features former Gerakan central committee member Toh Kin Woon launching the book ’50 Years Under the ISA’. 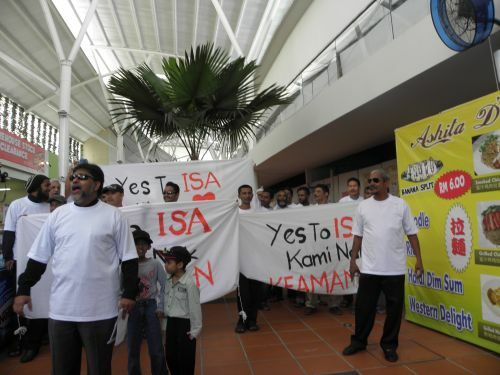 The ‘pro-ISA’ protestors – led by Penang Umno Youth chief Norman Dhalan and Komtar Merchants Association (KMA) vice-chief Abdul Ghani Mohammad Jiman – shouted ‘Hidup ISA!’ (Long live the ISA! ), ‘Halau pengkhianat!’ (Banish the traitors!) and ‘Hanya pencuri dan penyanggak takut ISA‘ (Only thieves and criminals fear the ISA!). Having proceeded to the front stage where speakers were scheduled to speak against the preventive detention law, the protestors however declined an invitation from the forum organisers to present their arguments on stage. At one point, a tiny scuffle broke out when one of the forum moderators Rozaimin Elias was slapped by one of the protestors when he tried to prevent them from advancing onto the stage. Later, activist Hishamuddin Rais (right, in photo below, with Abdul Ghani on the left) managed to persuade Abdul Ghani speak and explain why he felt the ISA should be continued. Ghani said that it was needed to protect the country, race and religion. He added that only a handful of people opposed the ISA and urged Malaysians not to be tricked by the opposition, that he said only offered sweet nothings and would bring doom to the people. “The ISA is used to chase away traitors; the opposition (Pakatan Rakyat) does not want the ISA to exist as they are the traitors of the country; they have destroyed this nation,” he said, while his supporters cheered him on. “It is also used to punish those who falsify other people’s identity cards or passports; without the law, there would be bombings and killings everywhere,” he added. “The ISA is not for ordinary citizens but for those who have squandered away the rights of others; these people talk about human rights, but what happened to the Komtar traders? We were evicted from our business premises,” he said. In August Ghani had led a protest against the state government for allegedly refusing a group of Malay traders to set up business at the Bazaar Ramadam at Komtar. The authorities had responded that Ghani had failed to pay the rental fees despite having collected the amount from the tradiers. Ghani meanwhile cried foul that he had been asked to pay up before setting stall, complaining this was not what the previous state government had practised. After his speech, Hishamuddin, who is also a writer and filmmaker, thanked Abdul Ghani for expressing his views; and reiterated that everyone should respect one another’s rights to freedom of speech. Hishamuddin, an ex-ISA detainee, complimented Abdul Ghani for a “well-spoken” speech and added that he would like to see the latter as his assemblyperson if he were voting in Penang. At this juncture, Hishamuddin took the opportunity to urge those who have not done so to register themselves as voters immediately, so that they can decide the future of the country. The protestors held a press conference (left) after the rally several metres away from the forum, with Abdul Ghani repeating much of what had been said earlier. The media failed to obtain comments from Norman, who was nowhere to be seen. Meanwhile, another protestor said he was “proud” of the ISA as it has allowed the rakyat to wander freely without fear in their own country..
Mohd Firdaus Madar Sahim, who said he represented no political party or group, said he was disappointed that the forum organisers tried to prevent him from entering the area. The Penang government has condemned the actions of pro-ISA protestors who attempted to disrupt an Anti-ISA forum today, as “Umno stooges” who failed to respect the people’s right to assemble peacefully. Komtar assemblyperson Ng Wei Aik (left) said the group, who tried to break up the forum around the theme “A political tool of oppression” organised by civil society groups, should show some respect and not disrupt panel speakers in the midst of presenting their views. He condemned the protest as “more violent than the Act (ISA) itself”. Ng, who is Penang DAP Socialist Youth secretary, said although both sides of the political divide could express their different views, it was ultimately the people who would decide whether the ISA be retained or repealed. “The silent majority will decide this at the general election,” he said, when met at the forum venue at Komtar Walk in Penang. Ng suggested that the pro-ISA protestors could put up candidates at the general election, as independent candidates or as candidates under the patronage of Umno. He also criticised the police for not taking action against the protestors despite officers at the police station in Jalan Pattani having been of the incident, adding that none turned up during the ruckus. Ng added that the police had informed that there were more than 10 special branch officers observing the event. “They should also play their role to ensure that this program runs smoothly instead of being disturbed by the protestors,” he added. As for the Komtar Merchant Association’s (KMA) involvement in the rally, Ng said that its vice-chief Abdul Ghani Mohamad Jiman who was at the forefront of the protest should instead look after the interests of the traders that KMA represents. “Instead he has come here to disturb other people’s event; how is he going to defend the traders after this? He is supposed to be a businessman,” he said. PAS vice-president Mohammed Sabu, who was one of the panellists, also expressed his disappointment over the police’s inaction. “Imagine if this were an Umno forum, and we are the protestors breaking up the session, how would the police act?” he said. “The police are not professional,” he added. When contacted, Penang Gerakan Youth chief Oh Teong Keong condemned the protestors, saying his party does not support “political violence”. Oh said that he had telephoned Norman, who was at the protest, regarding his participation but said that the latter had claimed he was present in the capacity of an NGO representative, not as Umno Youth. “If we have different views to express, we can always express it in a peaceful manner,” said Oh. At around 11.30 this morning about 50 people from the Komtar trading area along with Penang Umno Youth staged a rally at the premises to counter the forum discussing the ISA. 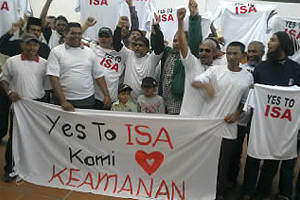 The ‘pro-ISA’ protestors – led by Abdul Ghani and Penang Umno Youth chief Norman Dhalan – were later invited on stage for about 10 minutes to express their views. One Response to "mob mentality from umno – as always, never change"
Those hooligans will one day become our politicians. Now you know why we are going backward. Good and moderate Malays not to mention the non-malays, will never have a chance to change anything in Malaysia. They are still too strong and they still think in term of bangsa and agama You cannot even hold a decent conversation with them. Those guys aren’t even good enough to clean drains in Singapore but this is the way thing are in Malaysia. With bad and corrpt leadership this is what we got.